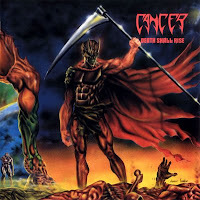 Cancer belonged to the elite of the British death metal scene, and could book a quite successful metal carreer afterwards. In music and quality both they reached the top alongside the local coetaneous bands. Their debut, "To the Gory End" was an all-round strong album already, but "Death Shall Rise" turned closer to the uprising death metal wave, and it was recorded in Florida's Morrisound studios. So it was a level up by the best quality sounding that could be reached that time. Since this album their thrash influenced death metal music gained wider international success. Strict and very accurate thrashy hammering and themes are the main features on the side of pure brutal sounding and the usual death metal lyrical topics about horror and the hideous aspects of reality. 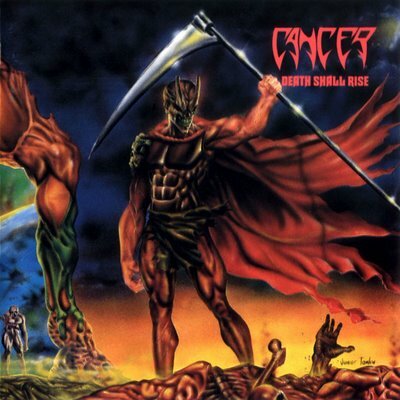 "Death Shall Rise" is a rough intense album, which had important influence on the British metal scene, and an enjoyable classic from the old school death metal times.